We expect The Chosen Ones in athletics to show up every so often. Usually, though, it isn’t so symmetrical. On July 31, 1966, the Buffalo Bisons hosted the International League debut of an 18-year-old prospect named Johnny Bench, up from the Carolina League. More than 20,000 were there to greet him at War Memorial Stadium, the largest International League crowd in Buffalo history at the time. A local union had bought out the tickets and handed them out for free. From what I could gather, every baseball-loving kid in Western New York showed up that day. Bench was considered a sure-fire major-league All-Star by the time he reached Buffalo. Fast forward exactly 52 years, and the same situation came up. Vladimir Guerrero Jr. is considered to be the best prospect in baseball, according to those who ponder such matters. The son of newly inducted Hall of Famer Vladimir Guerrero had been tearing up Double-A baseball earlier in the year. He hit .402 with 14 homers and 60 RBIs during his time in New Hampshire. Guerrero Jr. didn’t have anything more to prove at that level, so it was on to Buffalo – where the area’s baseball fans had been waiting all season for him. The 19-year-old slugger had a busy few days this week. He first stopped in Cooperstown to see his father’s induction into the Hall, and then came to Buffalo to make his debut on Tuesday night. More than 9,000 were waiting in Coca-Cola Field, a good-sized jump from a typical weeknight crowd at this time of the year. There was plenty of buzz for the contest, and not just because one of the parking lots jacked its price up to $20 for the game. (Pitiful.) Fans were allowed in early to watch batting practice, and some of them lingered along the right-field foul line in hopes of snaring an autograph from the young slugger. He even obliged some of them. Guerrero faced plenty of cameras and reporters in a pregame news conference, and the Bisons’ press box – which usually is close to empty when it comes to the actual media – was jammed. On this night, baseball mattered. Guerrero didn’t have a high bar to clear when it came to Buffalo debuts of potential superstars. In his very first inning as a Bison, Bench took a foul tip to the hand and had several of his fingers mashed. The catcher was lost for the season before taking an at-bat. Guerrero had better fortune. History did not repeat itself on this night, as there were no reports of anything close to a season-ending injury. This time we had a chance to see Guerrero in action for the full nine innings. Take his first three at-bats, which were relentlessly similar – walk, walk, walk. Yes, Guerrero’s on-base percentage was an amazing 1.000 at that point, but the lack of good pitches left the fans doing some good-natured booing of Lehigh Valley pitching. Still, Guerrero’s plate discipline was actually a good sign. After all, his first batting tutor – Vladimir Sr. – was known to swing at pitches anywhere in the area code … and hit them hard somewhere. Do what I say, not what I do. Later, Guerrero Jr. hit a rope to left field with the bases loaded. His attempt to get the Bisons back in the game after they fell behind, 8-0, at one point fell short due to a fine catch by Adron Chambers. Still, it was a sacrifice fly that made his box score line read 0 0 0 1. The IronPigs finally got him out in his last at-bat, so we’ll all have to wait for that first Triple-A hit. “The left fielder gets paid to do that,” Guerrero said about the play. Guerrero also displayed a good glove on consecutive plays in the field – one forcing him to go back on the ball, the other drawing him in. He obviously knows how to use a glove too. “Without a hit, you saw a lot of special things, and that was one of those things,” Meacham said. One game is a very small sample size when it comes to looking into the future. Bench rebounded from his injury in 1967, when he hit 23 homers in 98 games before leaving Buffalo for Cincinnati for good. You know how the story turned out – he’s in the argument for the greatest catcher ever. Guerrero probably won’t get that much time here. The expected path is for him to finish this season in Buffalo, and start next year as a member of the Bisons. That has more to do with contract status than ability, as rookies often have to wait for a call to the majors in order to delay certain triggers in contract rights such as arbitration and free agency. In the meantime, though, there’s always a chance that Guerrero will do something unforgettable while he’s here. And it’s nice to have the focus of the games on the field for a change. The Bisons can’t count on a winning team most years, as the parent club often raids its affiliates for good players when needed. It you can’t sell the steak, you sell the sizzle – and the promotions mix with baseball for an enjoyable night out. One of the few baseball-related thrills left, then, is the chance to see The Chosen Ones on their way up. Enjoy it while you can; the next one scheduled here is on July 31, 2070. 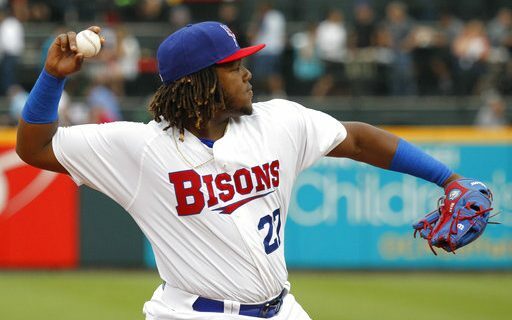 Tags: Bisons, Vladimir Guerrero Jr.